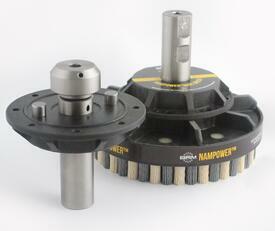 NamPower disc brushes are nylon abrasive brushing tools for surface finishing and deburring machined components. They feature a unique combination of ceramic and silicon carbide abrasive for maximum burr removal and efficient surface improvement. NamPower discs can help you to improve part quality and consistency, but which type of tool do you need for your application? 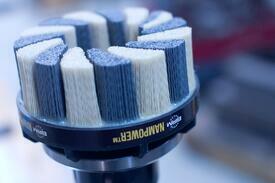 Brush Research Manufacturing (BRM) supplies NamPower disc brushes in different styles and sizes. The NamPower Resource Guide provides complete information about tool selection and use, but here’s what you need to know about achieving finer or coarser finishes. There are four main factors to consider: trim length, disc speed, grit size, and coolant use. For coarser finishes, you may need a smaller-diameter tool, too. NamPower disc brushes feature flexible nylon abrasive filaments that are bonded to a fiber-reinforced thermoplastic base. The brush tool’s filaments or bristles work like flexible files that wipe across the workpiece surface. For finer surface finishes, use a NamPower disc brush with longer bristles. For coarser surface finishes, use a NamPower disc with shorter filaments. (The image on the right is of a turbine-style brush). The NamPower Resource Guide provides suggested speeds for NamPower disc brushes. The optimum revolutions per minute (RPM) for a NamPower abrasive nylon disc is a function of various product specifications and operating conditions. 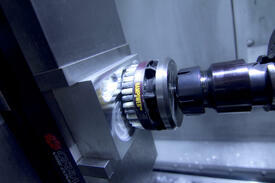 Typically, however, higher spindle speeds are recommended for finer finishes. For coarser finishes, slower spindle speeds are used. Along with trim length, grit size is another product specification that help determine optimum RPMs. Grit size is also a key consideration in achieving a finer or coarser surface finish. As a rule, higher grit sizes produce finer finishes. Lower grit sizes produce coarser finishes, but you may need to start with a coarser grit tool and then switch to a higher grit tool for a finer finish where significant work is required. NamPower disc brushes can be used with or without a coolant; however, filaments that are used with a coolant can spin faster without overheating and smearing. For finer finishes then, use NamPower discs with a coolant (wet). BRM’s flow-through tool holders disperse coolant from the disc brush center instead of from the edges and are available in a lightweight design. For coarser finishes, use the disc dry instead. Would you like to learn more about best way to use NamPower disc brushes with your manufacturing, machining, or metalworking application? For complete information about tool selection and use, download the NamPower Resource Guide.